We have a Christmas tree, it is decorated, there are lights. It is official. I am grown up-ish. The tree may be fake and only four feet tall, but is is cheery. I am also holding a Holiday party. There will be wine and food, and if I can make it—Eggnog. Right now Ankara is cold and dreary and rainy. I don’t mind the cold so much, but I wish the rain would switch over to snow. Then the world would be ready for Santa, because I know I am! 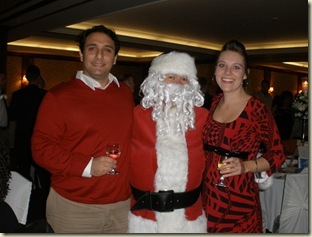 This entry was posted in Expat, Holidays, Santa and tagged Expat, Turkey by Jules. Bookmark the permalink. Yay for Holiday Parties! We're having one next Saturday, and I briefly contemplated making eggnog but decided it would be too hard. We're going to do hot buttered rum and mulled wine instead. Yum!